Given two rectangles, find if the given two rectangles overlap or not. A rectangle is denoted by providing the x and y co-ordinates of two points: the left top corner and the right bottom corner of the rectangle. Two rectangles sharing a side are considered overlapping. Note : It may be assumed that the rectangles are parallel to the coordinate axis. The first integer T denotes the number of testcases. For every test case, there are 2 lines of input. The first line consists of 4 integers: denoting the co-ordinates of the 2 points of the first rectangle. The first integer denotes the x co-ordinate and the second integer denotes the y co-ordinate of the left topmost corner of the first rectangle. The next two integers are the x and y co-ordinates of right bottom corner. Similarly, the second line denotes the cordinates of the two points of the second rectangle in similar fashion. For each testcase, output (either 1 or 0) denoting whether the 2 rectangles are overlapping. 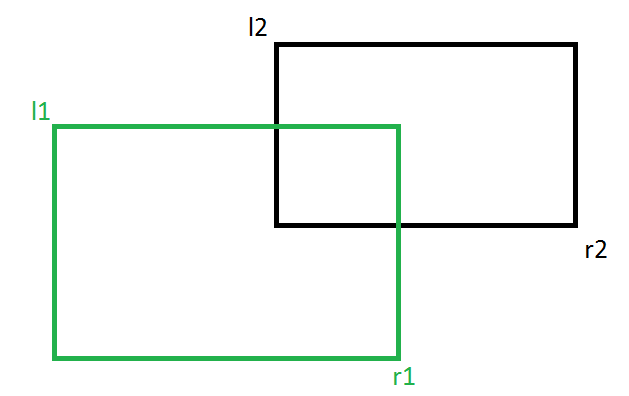 1 denotes the rectangles overlap whereas 0 denotes the rectangles do not overlap. Testcase 1: Given two rectangles overlap each other thus answer returns 1.